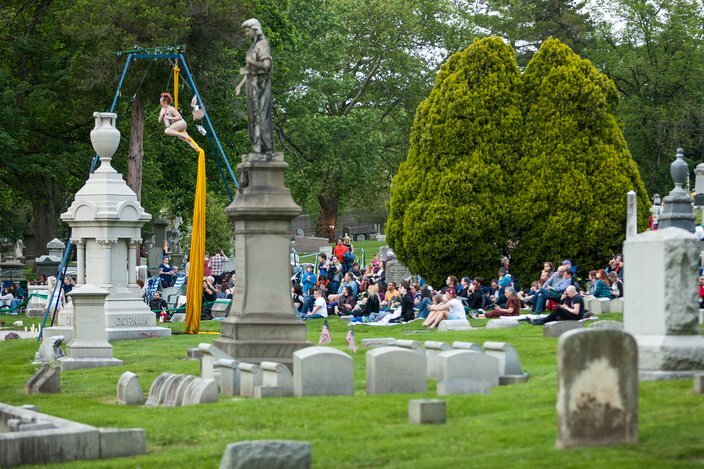 Lauren Raske, director of "The Ghostly Circus: Heaven's Lobby" and co-owner of 7textures, performs during Friday evening's event at Laurel Hill Cemetery. 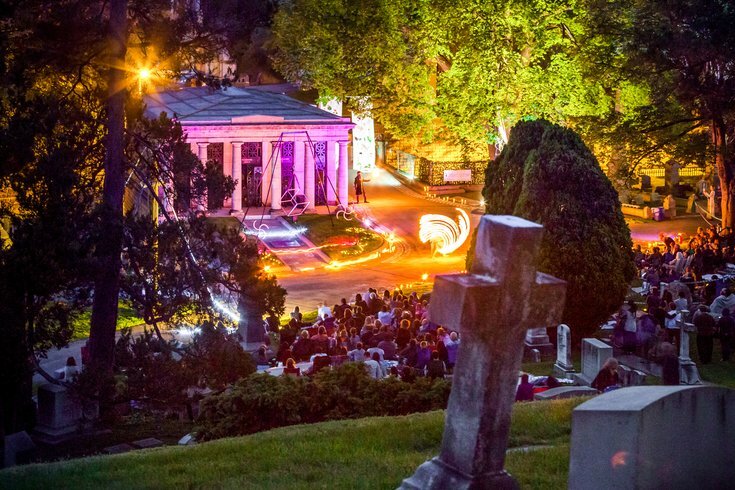 "The Ghostly Circus,” directed by 7textures, utilized the unique landscape of Philadelphia's historic Laurel Hill Cemetery to host an evening of fire and aerial theater amongst the cemetery’s gravestones, mausoleums, tombs and vaults on Friday, May 20, 2016. 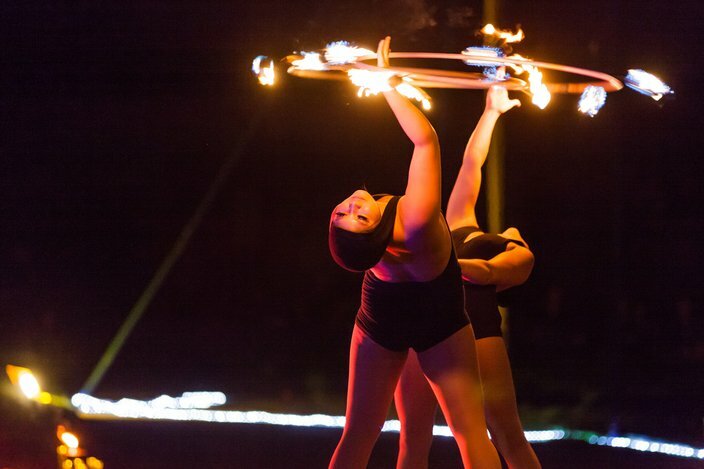 Under the moonlit sky, more than a dozen performers took to three custom stages and brought both gasps of excitement and cringes of fear to the hundreds who attended the family-friendly event. Below is a collection of images from "The Ghostly Circus: Heaven’s Lobby." Alicia Rennekamp, left, styles Laura Rennegade's hair before the performance. Mary Wood prepares drinks in the aerial bar at the start of Friday evening's performance. 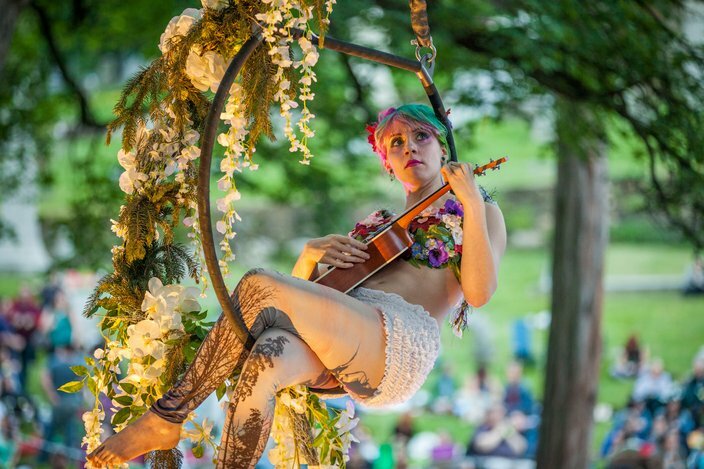 Lee Thompson quietly plays the ukulele while hanging from a lyra hoop during 'The Ghostly Circus' at Laurel Hill Cemetery. 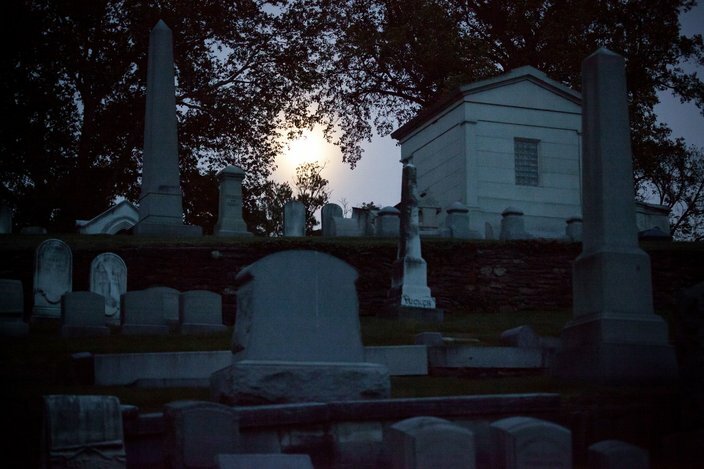 Moonlight illuminates the sky over Laurel Hill Cemetery, Friday, May 20, 2016. 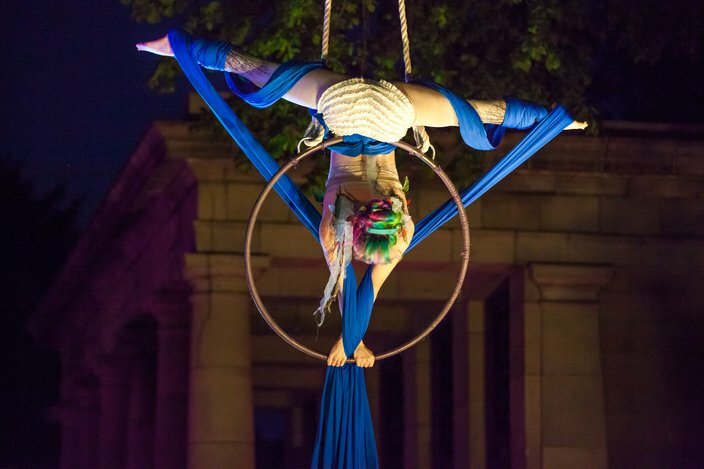 Lee Thompson weaves aerial silks around a lyra hoop during part of her performance. 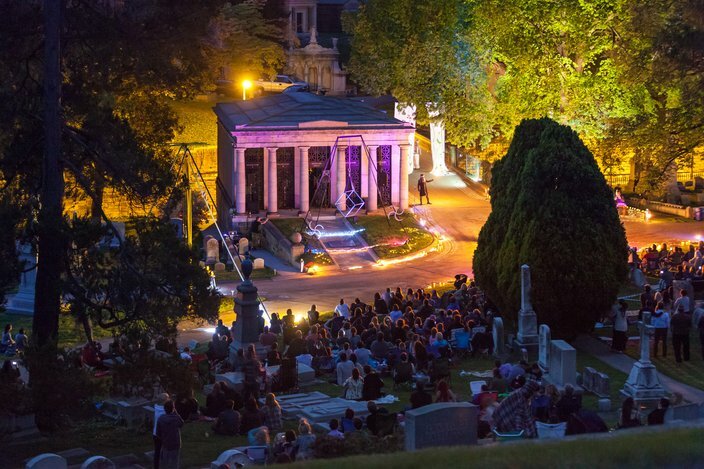 The audience sat amongst gravestones while they watched the performances at Laurel Hill Cemetery. 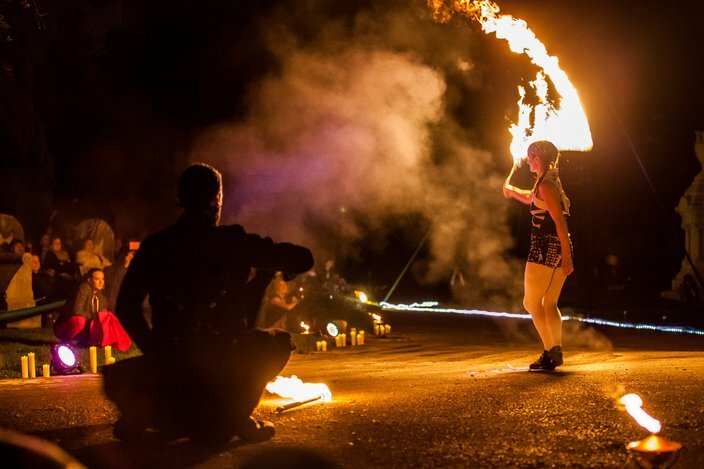 MB Forrester performs with a fire rope on 'The Ghostly Circus' fire stage. Laura Rennegade hangs from an aerial cube during a duet performance with Erin Flannigan. 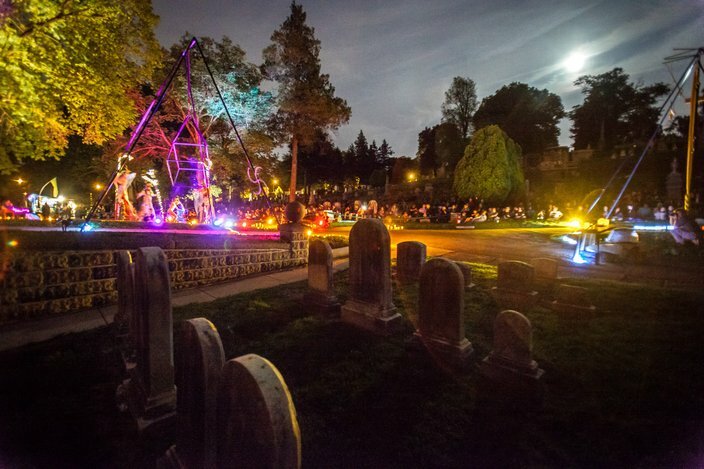 Different stages for 'The Ghostly Circus: Heaven's Lobby' were built into the landscape of Laurel Hill Cemetery. 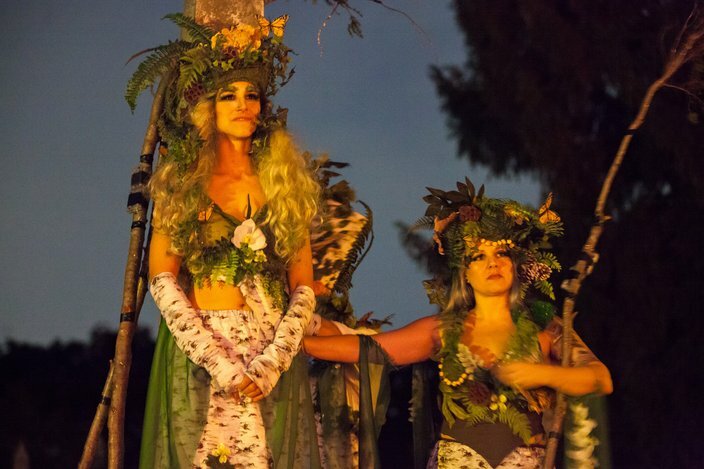 Samantha Hyman and Sharon 'Giggles' D'Angelo were some of the costumed stilt-walking trees that shared the landscape of Laurel Hill Cemetery during the performance. 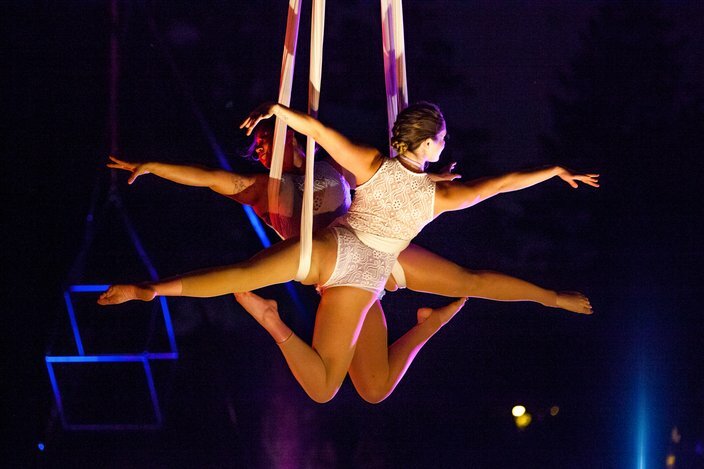 Wei Wei Weintraub and Rachel Lancaster shared a set of silk hammocks for an aerial duet performance. 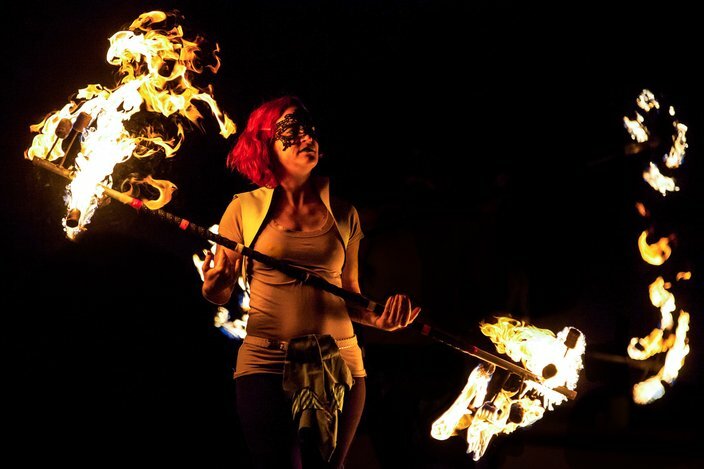 Erin Cory spins a fire dragon staff in 'The Ghostly Circus: Heaven's Lobby' at Laurel Hill Cemetery.